Joy Villa is aptly named, the beautiful location and design combined with the many amenities will give you a blissful vacation! This villa would be great for any group of vacationers. Exclusively luxurious 6 bedroom villa with amazing views! Villa Joy is located in Marigot within minutes of the beach and shopping. This brand new villa enjoys a beautiful view of the bay. 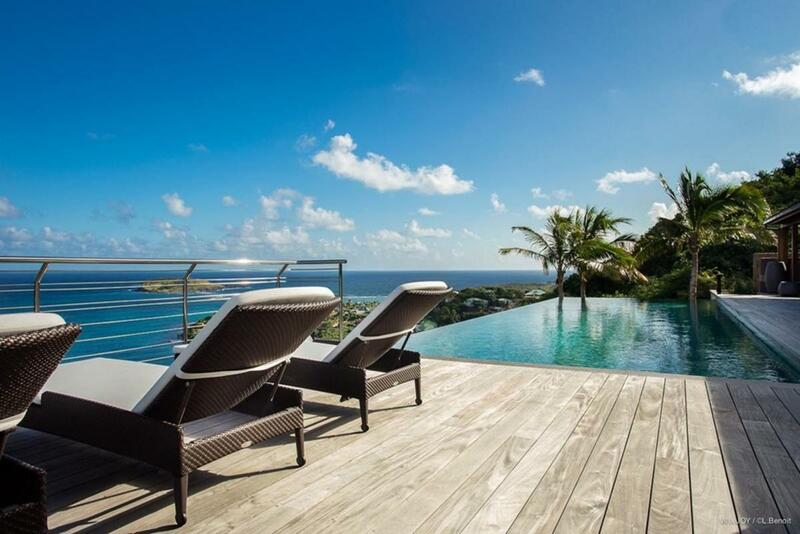 The infinity pool is surrounded by loungers and a balcony view of Marigot Bay. The covered deck features multiple sitting areas and an al fresco dining table that seats 14. A BBQ grill rounds out the outdoor living area. The spacious living room features a large L-shaped couch and opens to the pool terrace. A breakfast bar separates the fully-equipped kitchen from the living area. The kitchen opens to the al fresco dining area, which makes mealtime convenient as dishes are moved in and out of the space. Each of the 5 main bedrooms has a king bed, air-conditioning, a flat screen TV, and an ensuite bathroom with a outdoor shower. Three of the bedrooms are located in a separate bungalow from the villa, where the master suite lies. The 6th bedroom has a queen bed and ensuite bath, and is located on the lower level of the villa. A home cinema offers indoor entertainment, and the well-equipped fitness area rounds out the villa’s amenities.